Hoops boss Lennon considering move to bring former Celtic defender back to Parkhead. Dons ace Charlie Mulgrew knows what it’s like to be left back at Celtic. Left back in the youth ranks unable to break into the first team that is. But all that might be about to change with new Hoops gaffer weighing up whether to make a move for the young defender, who can also play as left winger, in what would be a shock return to Paradise for Mulgrew. According to a report in The Daily Record Lennon is keen to add two left backs to his squad. 24 year-old Mulgrew has been of the best players at Pittodrie this season, but is available on a Bosman after knocking back a new contract offer from Aberdeen last month. The fact that Mulgrew is available on a free, and his wage demands unlikely to break the bank at Celtic, has attracted Lennon’s attention as he goes about building a team to wrestle the title way from SPL champs Rangers. The Scotland Under-21 international also fits into Lennon’s plans to copy martin O’Neiil’s blueprint for success by buying British. With the added bonus Mulgrew already knows what it take to play for Celtic having been in the youth ranks when Lennon was captain. The 24 year-old defender was on the books as a teenager at Parkhead but was moved on to Wolves in the summer of 2006 after a loan spell at Dundee United. after a bust-up with Celtic manager Gordon Strachan. Jimmy Calderwood then signed him for the Dons two years later for a fee of £100,000. 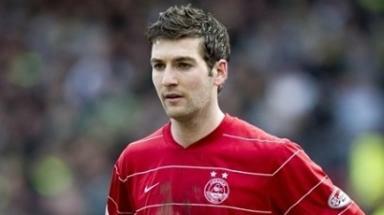 Mulgrew impressed during his two years at Pittodrie, particularly with his dead ball prowess from free kicks enamoured him with fans. However he has decided his future lies elsewhere. Last month Brentford approached Aberdeen about the possibility of signing him and a Greek club were also said to be interested in securing his servcies. Now all that could be set to change however as it’ss understood Mulgrew is aware of Celtic’s interest, and is now holding off in the hope that Lennon comes calling and he can return to Parkhead and show Celtic fans that he was good enough to wear the Hoops all along.